Submitted by Sandra Frith (nee Foster). Edward was Sandra’s grandfather and was born at Sheffield. Edward was Private 4723 3/4th York & Lancs. Home address was 12 Stepney Street, Sheffield. Father Edward Walker,(b.1855 Sheffield) mother Maria Walker (nee Pashley) of Coal Aston. 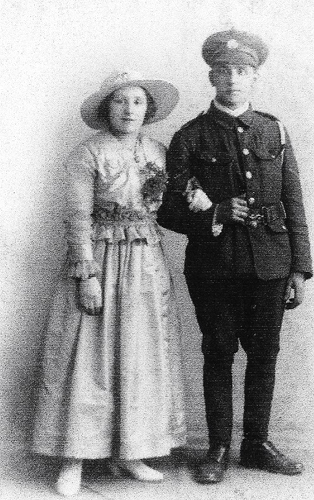 Married Ellen Rose 3 Feb. 1917. Had 2 daughters Norah and Dorothy (my mother).Lived in Felbrigg Road, Arbourthorne, and was a lamplighter for Sheffield Corporation after the war. Was a batman for Lieut. W H Bagshawe during the war and was wounded twice. Both were wounded at Ypres 9 Oct 1917 and grandad returned to France on 20 June 1918,following hospitalisation,operations and convalesence.,I believe his officer lost a leg and remained in England. He continued as a batman to a Lt.Jackson. Was wounded again on 23 Oct and following an operation at a field hospital returned to England for the last time to convalesce at Grange-over-sands. Remained on good terms with Mr Bagshawe and his sister who lived in Harrogate, and was invited every year to visit with his wife and two daughters,and he was also generously remembered in his will. Had 3 brothers also serving during the war; Charles,who survived the war, George (who was wounded in the head and never really recovered) and William John, who was killed in action on 22 Oct 1917 and is remembered on the Tyne Cot Memorial to the missing. Edward died at Sheffield on 24/11/1971.